Re: When are we going to see a patch to fix pets? Re: Can we fine tune the eating/seating behavior, please? Re: Has anyone done this? 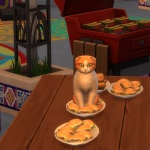 Re: I think my sim is having a glitch.